There is something so surprising about visiting a Maggie’s Centre: a fact that is remarkable after 21 years and 20 versions of these pioneering, humane healthcare buildings. For the few design professionals who don’t yet know about them, Maggie’s Cancer Caring Centres were inspired by Maggie Keswick Jencks, a landscape designer married to architect Charles Jencks, drawing on her own experience as a cancer patient, in the early, unenlightened Nineties. 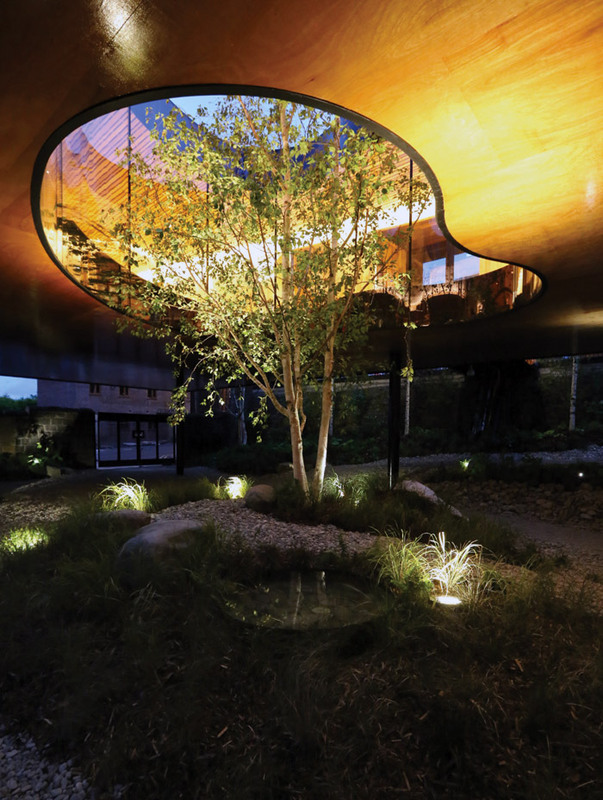 Sadly, she didn’t survive her cancer, but the couple’s vision, to work with leading architects to create uplifting spaces that would provide counselling, information and support for cancer sufferers, within hospital boundaries, has borne some pretty spectacular fruit. Over the years, the Maggie’s team has honed and refined the elements that work best for their audience into a really tight brief. First, there is the sense of immediate welcome; the kitchen table around which anyone can sit and chat over tea or coffee. Then there is the consideration for the different levels of privacy that people need: everything from cosy corners for private reading to calm consultation rooms. But above all there’s the abundance of natural daylight, with views on to gardens and nature, combined with their domestic scale and warmth. 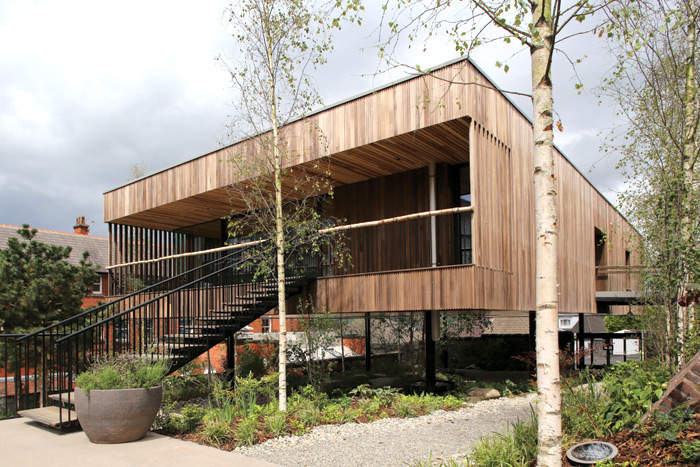 The latest Maggie’s Centre, dRMM’s enchanting matchbox on stilts, with a garden below and a tree at its centre, opened on the edge of Oldham’s hospital campus in June this year. And it’s still a delicious shock that anything as beautiful and characterful – and resolutely non-institutional – as this, should exist in a hospital setting. But what are the elements that make it so remarkable? Approaching its square, wood-clad exterior, the only thing that looks radical from the outside is its setting, incorporating a wide terrace that faces the Oldham campus, with a stairway leading down to chair-strewn patios, herb-filled planting tubs and a greenhouse in the garden – free for all to use – at its base. However, this Maggie’s is planned by dRMM founder and architect Alex de Rijke as a ‘box of surprises’, and there is certainly a gentle 'wow' factor when the large wooden front door opens on to a curving glazed void occupied by a solitary tree, framed by a sunshine yellow, poured resin floor. There is a pleasing smell of new wood. This building is almost entirely made from engineered American tulipwood. A longtime pioneer in timber structures, dRMM has been collaborating with the American Hardwood Export Council and ARUP to create an optimal version of a cross-laminated hardwood that is not only robust enough for exteriors but also attractive for indoor use. This is the first public building in the world lined in this material, inside and out. The exterior timber panels are heat-treated for weatherproofing, and feature a bespoke corrugated contouring to enrich the ageing process: even after only a few months in place, there is a pleasingly dappled effect. Simple timber panels also line the interior walls, and are placed in stripes across the ceiling. Yet, it doesn’t feel remotely like a sauna. What it does feel like is entering the most sophisticated of private houses, lovingly designed down to the last detail to suit its client. While the building’s form has a sculptural simplicity there is a domestic eclecticism to the furniture. The central kitchen table is a design of de Rijke himself, in pale tulipwood. An assortment of chairs, many upholstered in zingy shades of lime and orange, are scattered around the open social spaces. The building is raised up a level on steel legs to offer views out to the Pennines, but there are practical considerations too: Maggie’s prefers all its facilities to be on one level and dRMM wanted there to be a continuous connection between Maggie’s and the entrance to the oncology unit next door. A timber bridge over the void beneath the building helps to establish a clear threshold between the very different spaces. Ultimately it’s this level of care and character that sets these Maggie’s Centres head and shoulders above any other kind of public building – and its freedom from endless, ill-informed bureaucratic and procurement obstacles, which dilute the impact of good architecture elsewhere. For those with cancer, these havens have been genuinely life changing. And for those of us fortunate enough not to have experienced cancer first hand, they demonstrate the power of true collaboration between enlightened client and talented design team, harnessed to the idea not of gratifying their own egos, but improving – and even saving – lives.